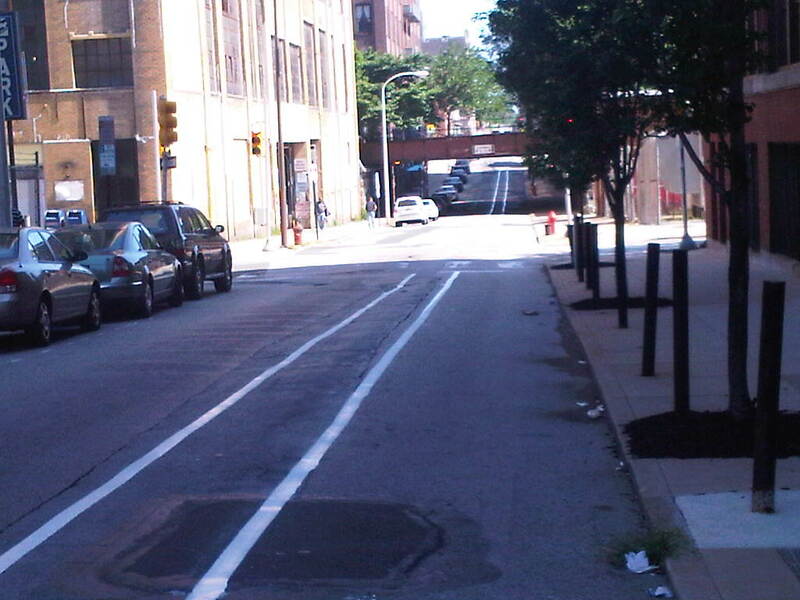 Work crews have completed bike lane work on 10th Street between Market and Lombard and on 13th St between South and Buttonwood Streets (1 block south of Spring Garden St). 10th Street north of Market will be getting its buffered bike lane upon the completion of the Chinatown Streetscape Project, which is improving sidewalks and lighting from Race to Vine. Along 10th Street there was great concern in the area of Jefferson Hospital, the stretch between Chestnut and Walnut is a scene of chronic weekday congestion and the fear was that the bike lane would spin this chaos into absolute gridlock, stranding ambulances and other emergency vehicles. But our casual observations suggest that the new configuration has ever so slightly created a sense of order. Crossing Market St on 10th and looking down towards Chestnut looks no different, but when the traffic light at Chestnut turns green the left turning traffic usually clears as soon as the pedestrians complete their crossing, and this often results in an open bike lane. It certainly has not made the congestion any worse and it has made cycling through there more pleasant. Pleasant of course is a relative term when you consider the poor pavement condition. Like most north-south Center City streets the experience varies from benign to bone jarring. 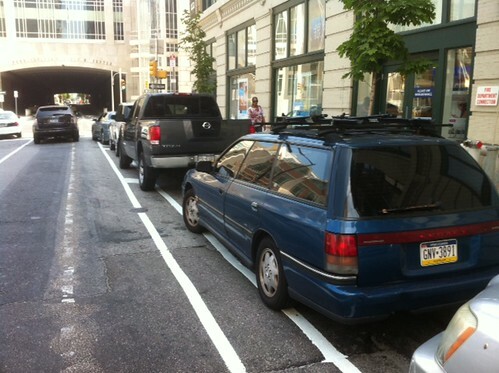 And yes the same loading and unloading vehicle issues on Spruce and Pine exist here, a problem that won't be resolved until the City takes the next bold step by creating physically separated bike lanes. Ironically, despite the initial opposition to the 10th street lanes coming from Jefferson and Chinatown, it's been the section of 13th between Filbert and Market that has become the most contentious to manage. It's a stretch of street used by workers at the Justice Center and Police Officers, who now have park elsewhere. Hopefully, everyone will adjust accordingly, but to date there seems to no indication that conditions have changed. Are there people who practice and enforce the law that believe they are above the law? We'll see. 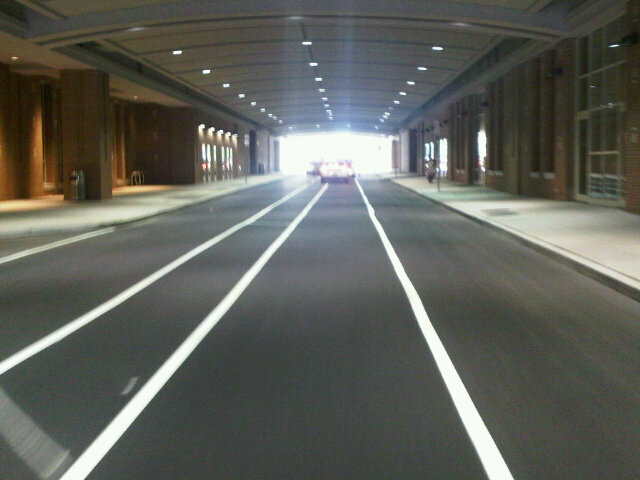 Heading north on 13th the bike lanes take on an out of the ordinary configuration through the ground level tunnel of the Convention Center. The bike lane which is located to the left of the loading zone/shoulder looks enough like a travel lane for right turning motorists drive in it. Finally the bike lane heads north into the loft district past Callowhill and under the Inquirer Building Branch of the old Reading Viaduct. Once under the RR bridge the street plows uphill where the bike lanes end abruptly at Buttonwood St. Between Buttonwood and Spring Garden existing parking on the right hand side is currently preventing the extension of the bike lane. Sharrows have been placed along this final section of 13th. The merge uphill has been a sore spot for some cyclists and the City may be amenable to parking changes in the long term. In the near future bike improvements will continue north on 13th St to Temple University with bike lanes (where there is sufficient width) and sharrows everywhere else. No travel lanes will be lost. We would like to hear your thoughts on the 10th and 13th Street bike lanes. Please feel free to comment. More eye-level signange indicating bike lanes,fill in the most dangerous pot-holes, and more cyclists will start using! are their plans to have them extend further south?